Rainbow Rowell is an American author of young adult and adult contemporary novels. Her young adult novels "Eleanor & Park" and "Fangirl" both received a great deal of critical acclaim in 2013. 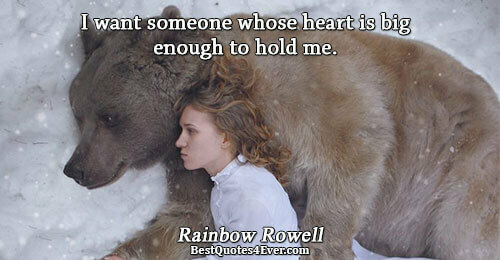 I want someone whose heart is big enough to hold me. The world turned itself into a better place around him. Holding Eleanor's hand was like holding a butterfly. Or a heartbeat. Like holding something complete, and completely alive. What are the chances you’d ever meet someone like that? he wondered. Someone you could love forever, someone who would forever love you back? And what did you do when that person was born half a world away? The math seemed impossible. It was the nicest thing she could imagine. It made her want to have his babies and give him both of her kidneys. Don't bite his face, Eleanor told herself. It's disturbing and needy and never happens in situation comedies or movies that end with big kisses. I don't like hello. It makes me sound like I have dementia, like I've never heard a phone ring before and I don't know what's supposed to happen next. Hello? Sometimes writing is running downhill, your fingers jerking behind you on the keyboard the way your legs do when they can’t quite keep up with gravity. When I’m writing my own stuff, it’s like swimming upstream. Or … falling down a cliff and grabbing at branches, trying to invent the branches as I fall. Not this in-between thing that Levi had, where his brain could catch the words but couldn't hold on to them. Because all her feelings for him – hot and beautiful in her heart – turned to gobbledygook in her mouth. Eleanor let his words hit her full on. I don't want to do anything. I don't even want to start this day because then I'll just be expected to finish it. My girlfriend is sad and quiet and keeps me up all night worrying about her. I didn't know love could leave the lights on all the time. I love you more than I hate everything else.